MOBILE, AL – After parting ways with Matthew Graves, South Alabama announced Richie Riley as their new head coach for men’s basketball. The announcement came Thursday from South Alabama Athletic Director Joel Erdmann. A formal announcement will be made Friday at 2 p.m. at the Waterman Globe in the Mitchell Center. Riley, 35, coached the Nicholls State Colonels to a regular season championship in the Southland Conference last season. His team went 21-11 overall and 15-3 in conference games, which marks the first time Nicholls State had a positive record since the 2008-09 season. Riley adds to his resume with experience as an assistant coach at Clemson for two seasons. During his time there, the team won 10 ACC games for the fifth time in school history, and they picked up wins against top teams such as Arkansas and NC State. He also has experience as an assistant at UAB from 2012 to 2014, in which the Blazers made an upset victory over No. 16 North Carolina in the regular season. “Since my days at UAB and Clemson as an assistant, I’ve always looked at South Alabama as a sleeping giant,” Riley told South Alabama Strategic Communications. “I think with the resources we have, there is no reason we shouldn’t be competing for championships every year in the Sun Belt. 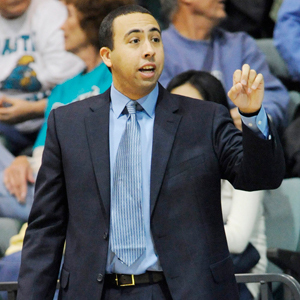 Riley started his Division I coaching career with a current Sun Belt team, Coastal Carolina. From 2009 to 2011, the Chanticleers were in the Big South Conference, and as an assistant, Riley helped the team post a 56-13 overall record and 31-5 conference record. Coastal Carolina received invitations to the NIT for each of his two seasons at the school. For more, tune in to the Opening Kickoff on WNSP weekday mornings from 6 a.m. to 9 a.m.